In the Alaskan wilderness, an owl and its mate prepare for a new family. And you’re invited to visit! Hawks are hawks, and owls are owls, of course. The northern hawk owl above is indeed an owl, but it’s a little like a hawk, too. Like all owls, for example, it has a broad face with large, forward-facing eyes. But, like hawks, it usually hunts during daylight and is a fast flier. Also, like many hawks, it has a long tail, and its wings are short and pointy. Those give the owl a hawk-like ability to twist and turn easily while flying quickly over, around, and between trees. The area where hawk owls live isn’t just any kind of forest. It’s called the boreal (BOR-ee-uhl) forest. This northern habitat is made up mostly of evergreen trees such as spruces and firs, and it covers lands across the world’s northern regions (see map). 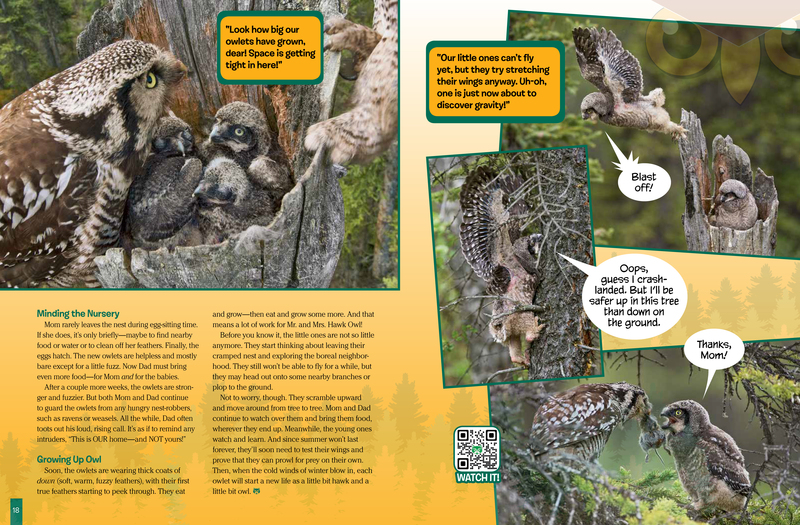 When the top of a boreal tree breaks off, it makes a cozy space for a hawk owl to hide and rest—or to start a family. Up here in the boreal forest, winters are long and summer are short. Naturally, summer is the best season for raising a family. That’s when the most food is available for feeding hungry, growing owlets (baby owls). So, it’s good to get an early start—even before winter’s winds have died down. First, Mama and Daddy Owl find a good place to nest. They may choose an empty hole in a rotting tree trunk. 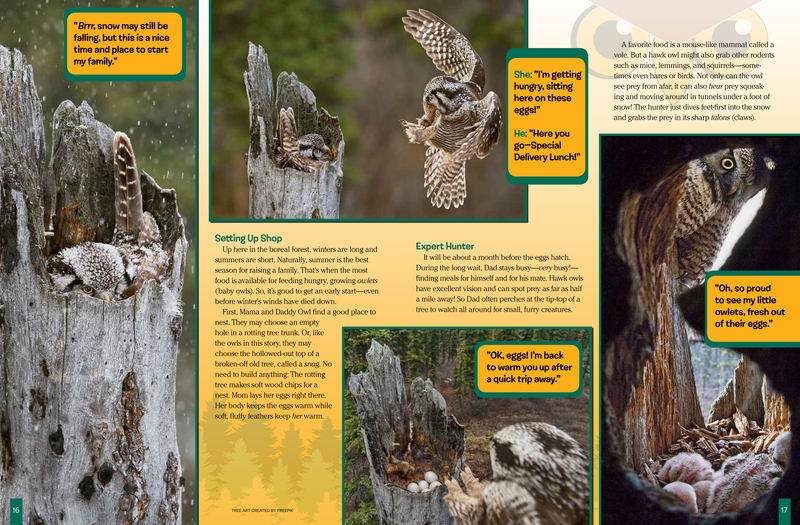 Or, like the owls in this story, they may choose the hollowed-out top of a broken-off old tree, called a snag. No need to build anything: The rotting tree makes soft wood chips for a nest. Mom lays her eggs right there. Her body keeps the eggs warm while soft, fluffy feathers keep her warm. It will be about a month before the eggs hatch. During the long wait, Dad stays busy—very busy!— finding meals for himself and for his mate. Hawk owls have excellent vision and can spot prey as far as half a mile away! So Dad often perches at the tip-top of a tree to watch all around for small, furry creatures. A favorite food is a mouse-like mammal called a vole. But a hawk owl might also grab other rodents such as mice, lemmings, and squirrels—sometimes even hares or birds. Not only can the owl see prey from afar, it can also hear prey squeaking and moving around in tunnels under a foot of snow! The hunter just dives feet-first into the snow and grabs the prey in its sharp talons (claws). Mom rarely leaves the nest during egg-sitting time. If she does, it’s only briefly—maybe to find nearby food or water or to clean off her feathers. Finally, the eggs hatch. The new owlets are helpless and mostly bare except for a little fuzz. Now Dad must bring even more food—for Mom and for the babies. Soon, the owlets are wearing thick coats of down (soft, warm, fuzzy feathers), with their first true feathers starting to peek through. They eat and grow—then eat and grow some more. And that means a lot of work for Mr. and Mrs. Hawk Owl! Before you know it, the little ones are not so little anymore. They start thinking about leaving their cramped nest and exploring the boreal neighborhood. They still won’t be able to fly for a while, but they may head out onto some nearby branches or plop to the ground. Not to worry, though. They scramble upward and move around from tree to tree. Mom and Dad continue to watch over them and bring them food, wherever they end up. Meanwhile, the young ones watch and learn. And since summer won’t last forever, they’ll soon need to test their wings and prove that they can prowl for prey on their own. Then, when the cold winds of winter blow in, each owlet will start a new life as a little bit hawk and a little bit owl. 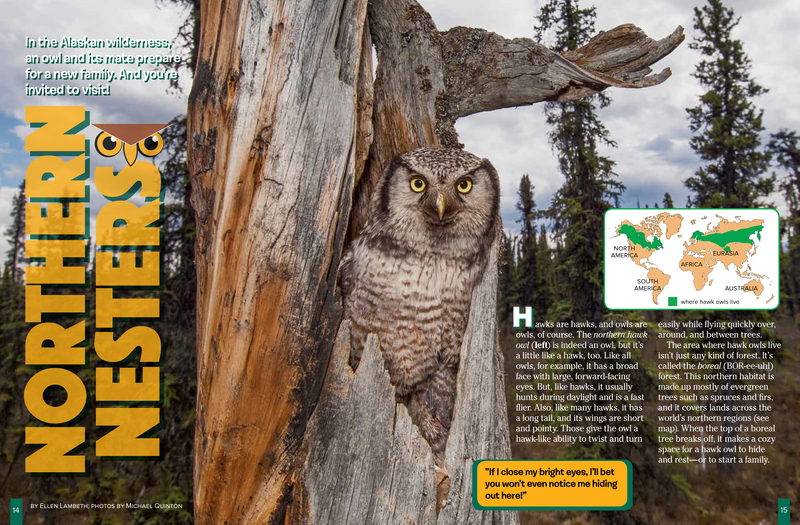 “Northern Nesters” appears in the May 2018 issue of Ranger Rick magazine.